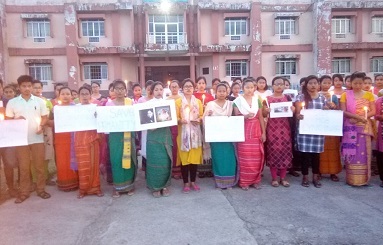 Hundreds of students of Law College, Bodoland University, members of Smile NGO and locals jointly protested against the inhuman killing of two youths from Guwahati at Panjuri village under Dokmoka PS in Karbi Anglong on June 8. 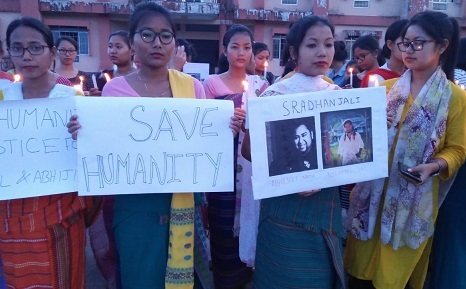 The protest programme was organized by the Bodoland University Students’ Union (BUSU) at the Bodoland University compound. The students also observed one-minute condolence and lit candles while mourning the death of the deceased artistes – Nilotpal das and Abhijeet Nath. The students strongly condemned the act and sought stringent punishment to the culprits involved in the mob lynching on June 8, 2018 at panjuri village of Karbi Anglong district. “The culprits must be punished for their inhumane act as per the law,” the protestors said. 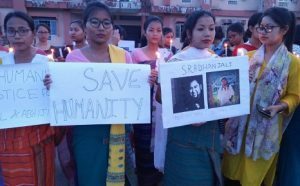 Speaking on the occasion, the general secretary of the Bodoland University Students’ Union, Akhi Basumatary, appealed to all not to trust the fake news being spread on the social media without verifying it.